Back home in Bolivia! My cat seems to have enjoyed her stay away in my absence in a home of Death Metal music fans… a noisy and action-packed home which also includes two kids and two parrots. She appears to need to sleep off all that excitement and has spent much of the last two days flat on her back with legs in the air, dead to the world. As for me…I need a rest after all the excitement too! Was it really a whole seven weeks ago that I arrived in California and wove with my friends there? 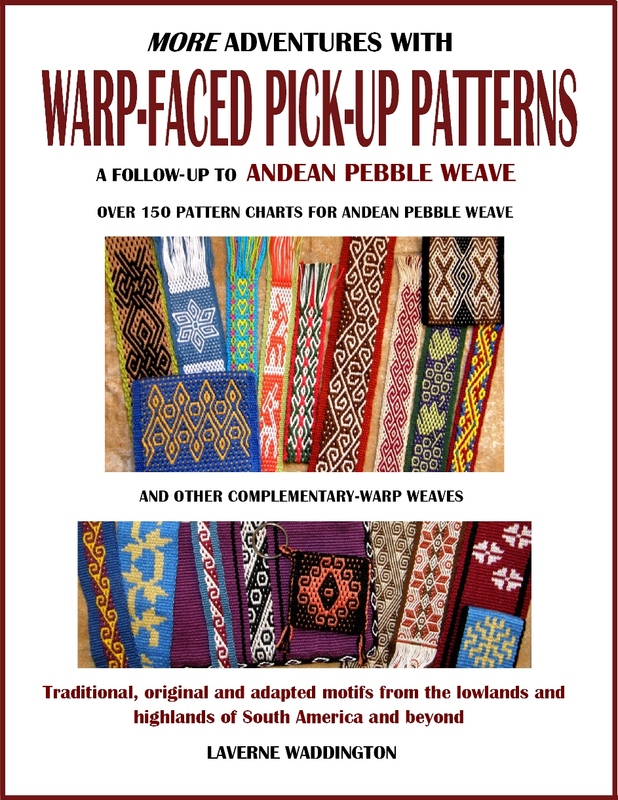 We had a very productive time weaving supplementary-weft patterns and the intermesh technique and spent one relaxing afternoon looking at my images and videos of South American backstrap weavers. My trip ended in the same area. It was great to meet up with my Ravelry friend, Cookie, once again. She had woven with me at Janet’s place up north two years ago and brought along the pebble weave backstrap that she had woven for herself in the meantime. This is a great example of taking one of the simple 4-revolution patterns from my first book and expanding it by weaving it side by side as a reflection of itself. Cookie also added some other small elements which made the pattern unique. It was almost impossible to recognize the orignal 4-revolution motif. 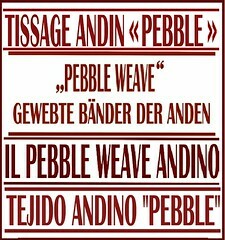 I love it when people create their own pebble weave designs. This is a great way to approach it – with baby steps – first adapt and enhance an existing design and from there go on to create a motif that is entrely your own. We used sticks to help pick up threads and pass the supplementary wefts. Cookie saw my Guatemalan pick-up stick and went on to create her own from chopsticks! 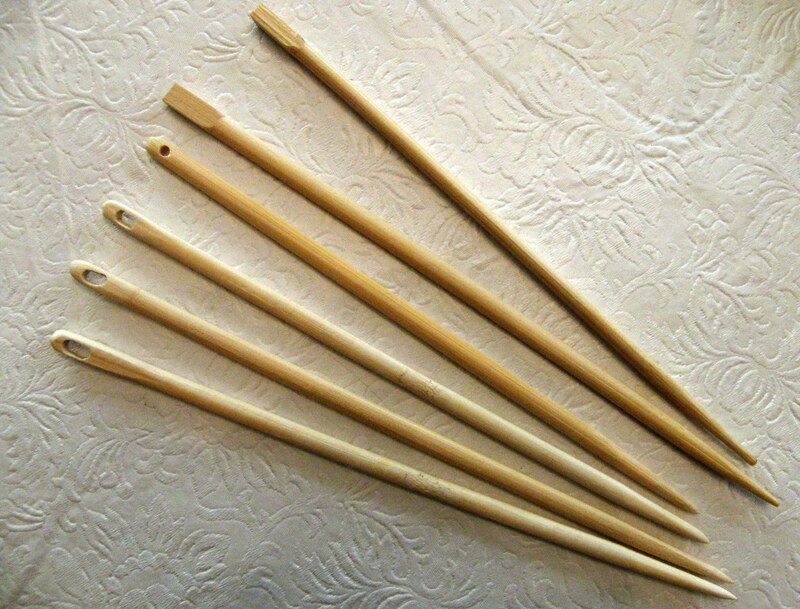 See the original chopsticks on the right and then several versions of the pick-up stick that Cookie made. Days were spent weaving in Barbie’s home and I enjoyed my evenings staying with Kathleen. I got to stay in her cottage weaving studio in the garden and listen to the soothing sound of the waterfall in the forest below. 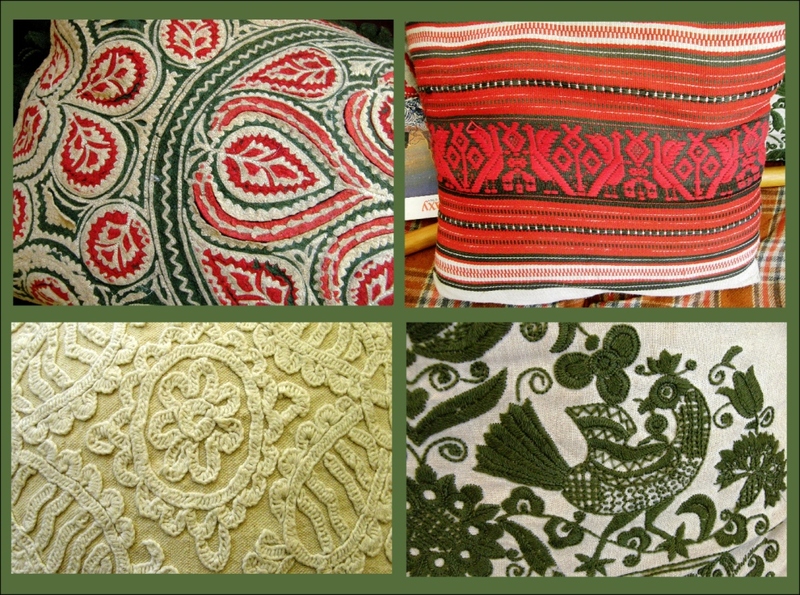 Kathleen’s home is decorated with textiles from Hungary, her husband’s homeland. Here are just a few of them. The felt piece at top left comprises layers of wafer-thin pieces of felt using applique and reverse applique techniques. A Google search result tells me that this particular design falls into the category of Great Plain motifs, the Great Plain being the central plain of the Carpathian Basin. 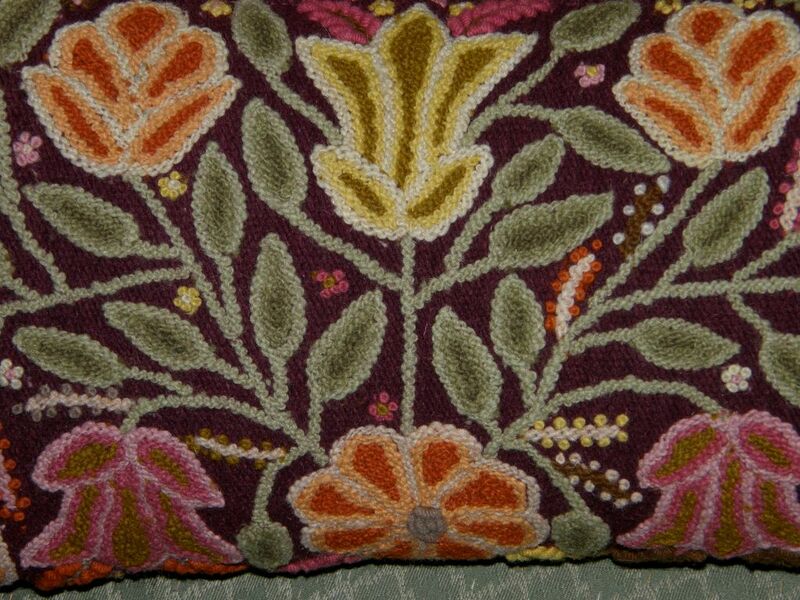 The motif dates back to the 18th century where it was first seen on the wool cloaks of the Hungarian shepherds. 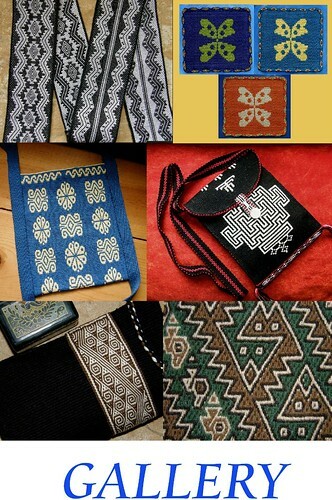 I then uncovered a website which is a gold mine of information on embroidery techniques when I googled about Hungarian embroidery. This site is amazing! I will leave you to explore it. I will certainly be returning to it to learn more. I can see myself doing embroidery one day should there come a time when I can’t weave with a backstrap loom anymore. As long as my eyesight is up to it! 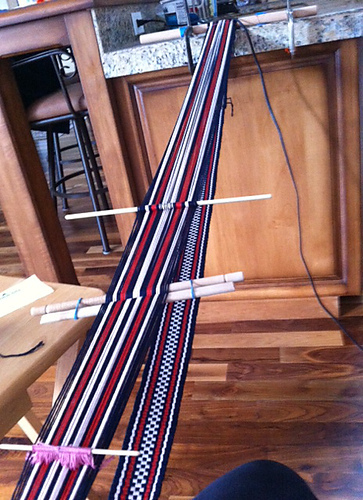 I spent a fun afternoon with my weaving friend Dorothy. We went to an exhibit of Indian textiles at the San Jose Museum of Quilts and Textiles. It was a hands-on afternoon where we got to learn a little about Kantha embroidery. It was an introductory session that any embroidery novice could handle just to get a taste as it is based on a simple running stitch. I attempted to embroider a classic paisley motif which is a mango shape. If I ever get it finished I shall show it to you. We also got to play a little with hand-cut Indian wood blocks which are used to print designs on cloth. You can see the paisley pattern above. I think the wood blocks are a work of art in themselves. I also learned that you need to put some thought into the layout of the deisgn before stamping away like mad. I made a chaotic horrid mess! 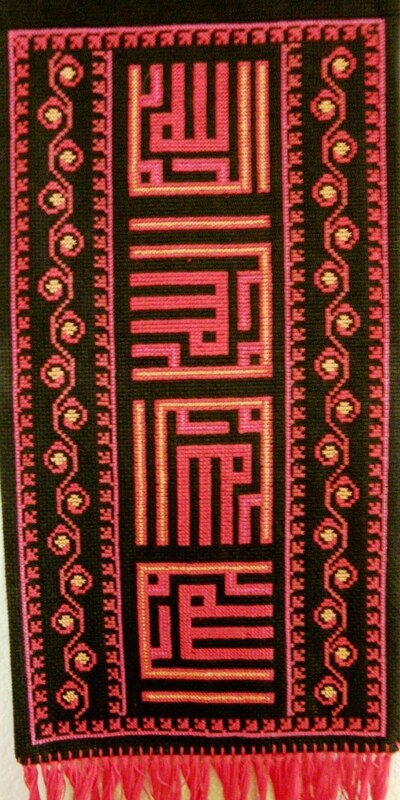 I would love to know what embroidery stitch was used to create this piece that Dorothy bought from a Peruvian handcraft website. The yarn was so fluffy that it was very difficult to isolate the path of the threads. The stitch had a braided look to it. I would love to know how to do it. Can anyone help? At Gloria and Terese’s home, on my last night in the US, I saw this piece of Palestinian cross stitch embroidery that they had collected. I would love to know about the motif in the center. One pattern has been repeated from top to bottom while being rotated 90 degrees. Does anyone know about this motif and what it might represent? For more about these embroideries and the women who create them, take a look at this beautifully made site which has been put together with the support of the Red Cross of Iceland. 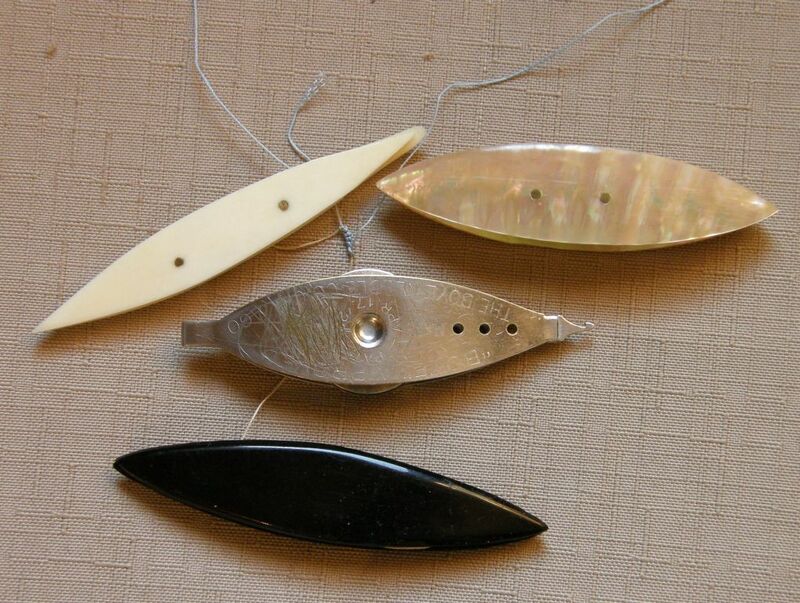 And, as always happens, when I learn a little about a new craft, examples of it seem to just fall out of the sky into my hands where ever I go! 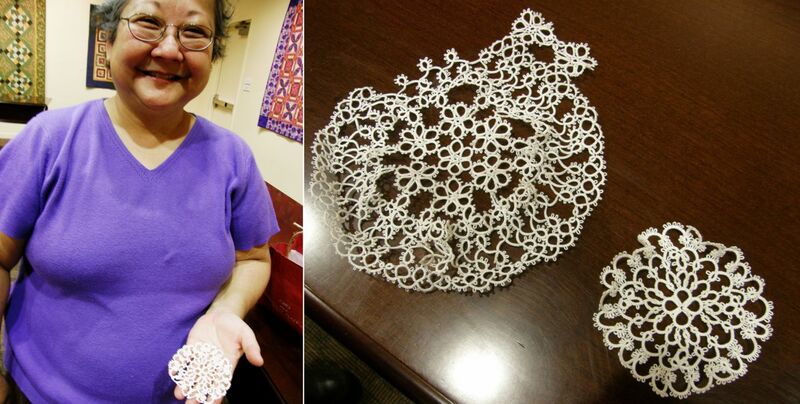 Not embroidery….tatting! One of the participants in the Indian texiles workshop was a tatter and showed me her work in progress. The larger of the two pieces will be a baby’s cap. I am in awe! Thank you, Vonnie, for teaching me to tatt. Rachel had recently got these as part of a big purchase of sewing supplies at an estate sale and was happy to pass them on to me. I think I had better get a-tatting! I like the metal one the best with the wee hook on its ponited end. Now the challenge is to see how simple tatting can be applied to my weaving. 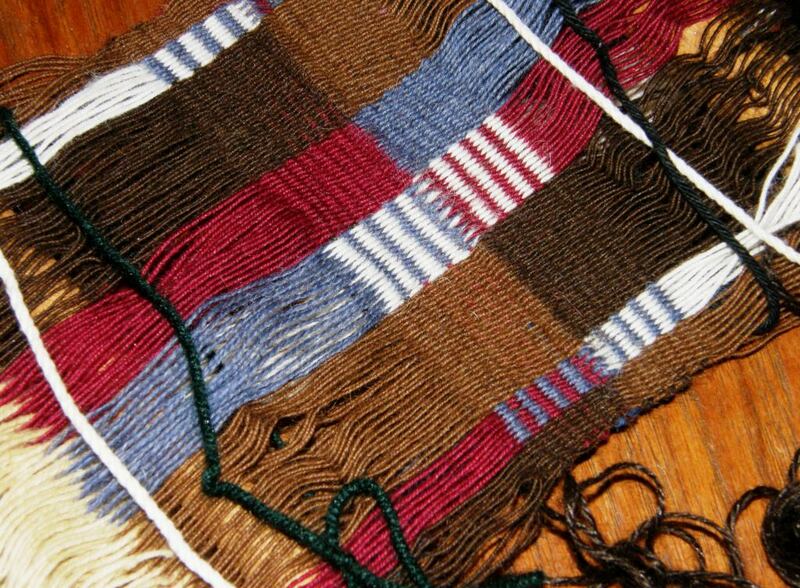 My online weaving friend Carol, who lives in Nicaragua, told me that this same idea also recently occurred to her. I would probably use wool instead of the super fine thread that is usually used for tatting. From embroidery to tatting and now back to a bit of backstrap weaving. You may remember the discontinuous-warp piece that I got to play on. I wrote about it in my last post and have written several posts, like this one, about the technique. I need to point out that this warp is not mine to keep. I was simply put in charge of transporting it from Yonat to Dorothy, its new owner, and my fee for the service was being allowed to play on it a bit! In any case, Dorothy needed a hand getting it going and I was happy to be of help. 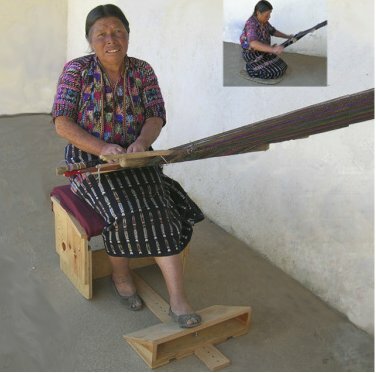 This warp was used in a workshop on the ticlla technique that was given by Nilda Callañaupa in the US in 1997 and the project was never finished. Dorothy and I both had a lot of fun playing with it. I wove from the end that had been started in the workshop and got the weaving on the other end established so that Dorothy could continue. Of course all the sticks are really too long for this project but this was the way it had been set up in the workshop and we didn’t see any reason to change things. 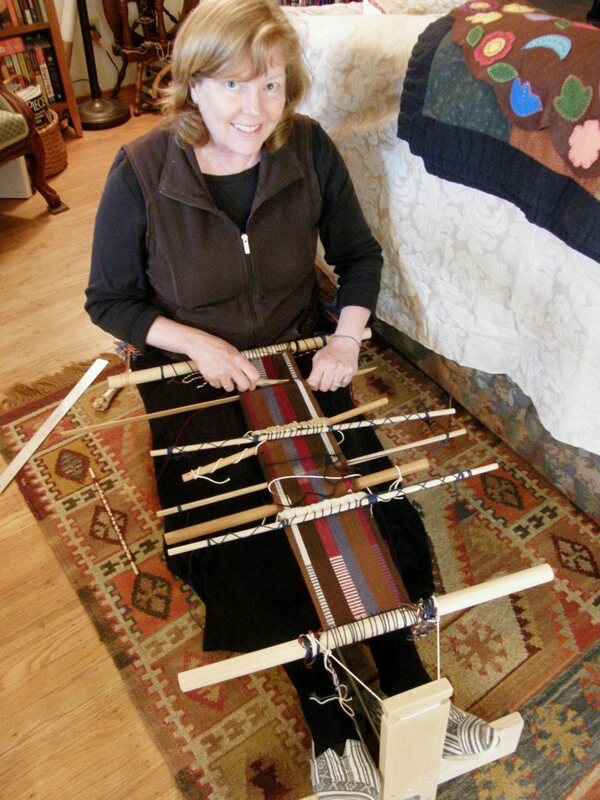 You can see that the warp has been turned around and there is Dorothy with the llama bone tool in hand beating in the weft. Dorothy was kind enough to have me stay for a few days and there was precious little time to weave this together as Dorothy teaches art during the day. Coming home from a tiring day teaching art to children is not really a good way to face a tricky piece of weaving. So, while Dorothy was at work, I removed the dovetail stick in the center that holds everything together. A thick piece of thread remained behind in place of the stick. 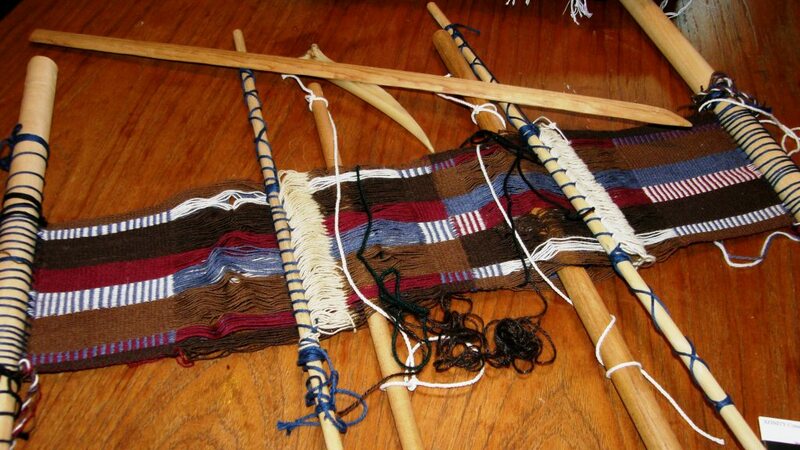 Then the join had to be stabilized by weaving on each side of it as you can see above. It is now up to Dorothy to finish the piece. She will continue to weave until it is impossible to open the sheds any more using the shed rod and heddles. Before she gets to that point she will be able to make things a little easier by using a thinner shed rod and passing the weft on a needle. The final stage will have her needle-weaving, picking up every other thread on the blunt end of the needle so that she can create a shed and pass the final wefts shots. She will have to do this on both sides of the center as each panel is a separate four-selvedge piece connected by the central dovetail join. The name of the previous owner was Jean Davidson. She was an amazing artist, curious to no end with an amazing sense of color and structure. Her unique talent was her chenille-style quilts. She was an awesome lady, and I just feel like her energy is bubbling in that project that you guys are playing with. 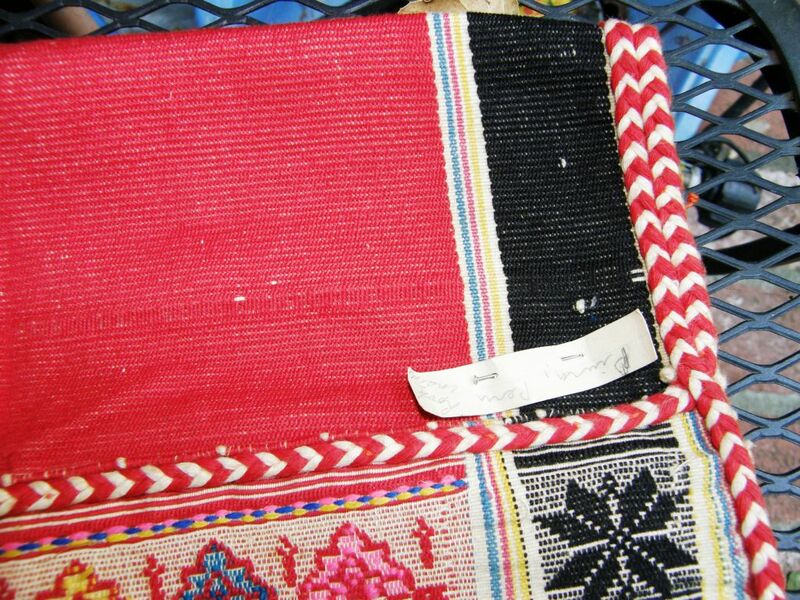 Yonat also gave me a link to a site which shows the quilts that were part of an exhibit held in Santa Cruz in 2008 called Dreaming the Earth in which Jean participated. texts/aus/alt/index.htm) Abbreviated versions of these stories may be found next to the photographs of each of the quilts. The quilts are beautiful and the stories delightful. 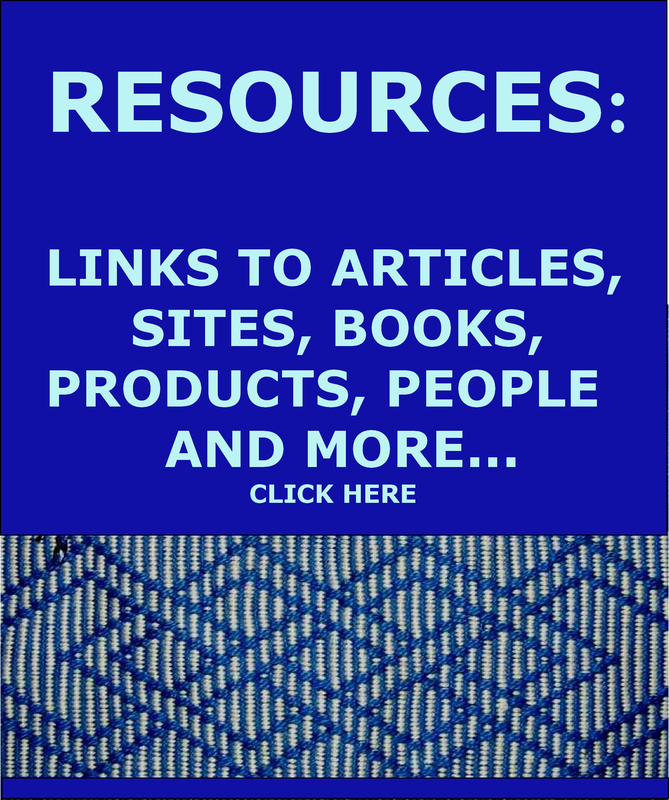 It is really worth taking a look at the site. How nice to be able to weave on this piece that Jean started. 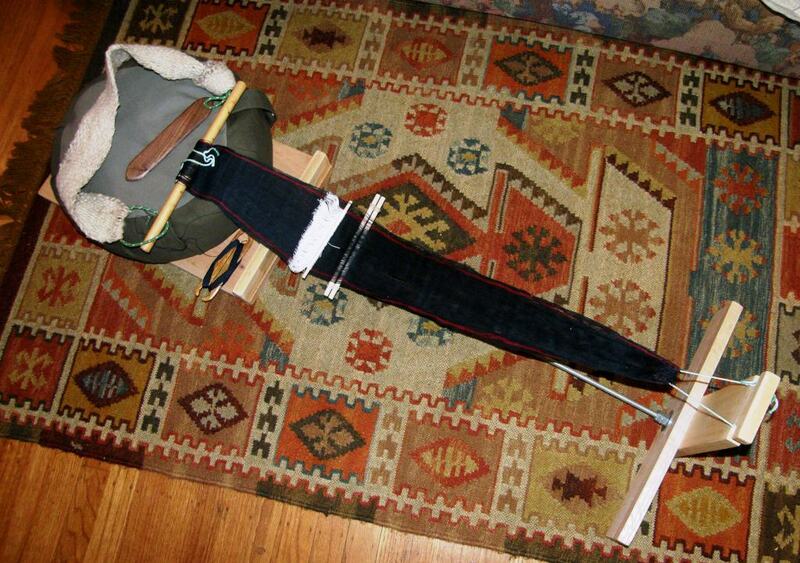 If you are wondering about Dorothy’s set-up for weaving that I showed earlier, let me tell you more. She had that built following instructions by my online friend Sharon on her blog. Sharon is really talented when it comes to DIY and improvisation and she told me about a cool seat, foot rest and warp hitching post that she made so that she could sit on the floor with her back against the sofa and weave. I posted the link here, Dorothy saw it and had it made. I got to try it and it is very cool. I like being able to brace my feet against something although I am wondering about the strength of the foot brace. There it is again above with one of my demo warps in place and a cushion on the seat for extra comfort. 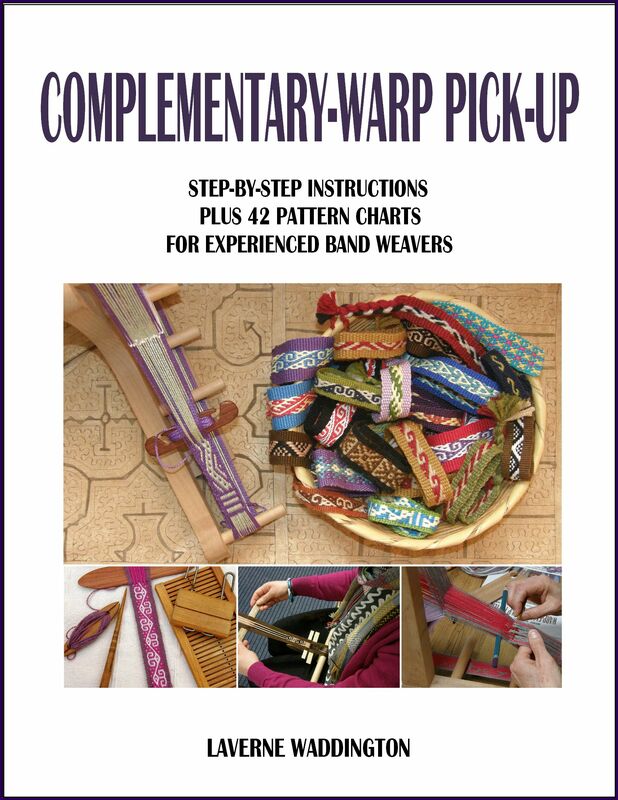 Meanwhile, Bobbie from the Ravelry Backstrap Weaving Group reports that she has bought, for around $30, all the parts necessary for making the ergonomic bench for backstrap weavers according to the plans put online by Synergo Arts. We all looking forward to seeing how that turns out. You can find plans for the bench with instructions on how to use which include a video here. Mark showed me a woven cotton saddlebag. 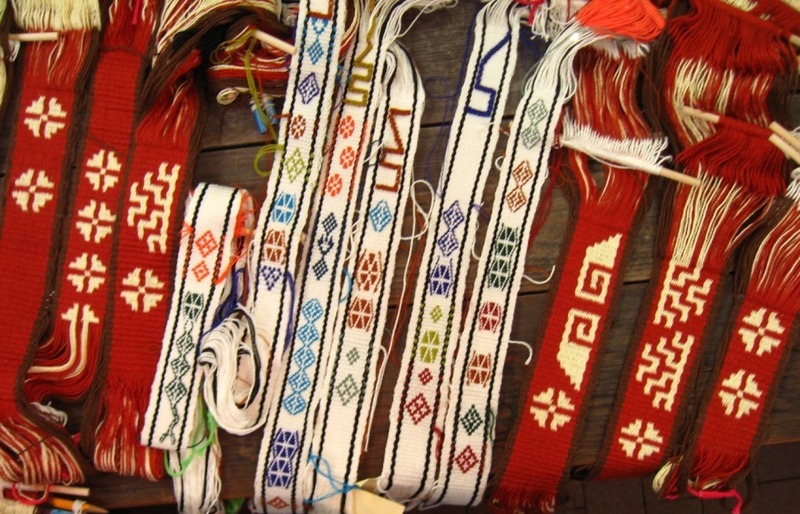 It is from the Piura region of Peru and I had never seen anything like it before…the jaw-dropping diversity of Peruvian weaving! The red and black designs are warp patterns. 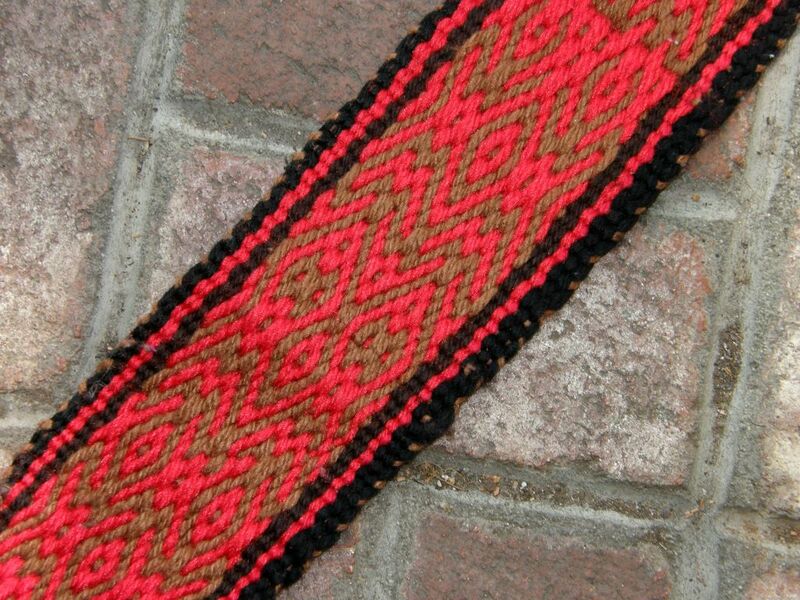 The other colors that fill in parts of the main motifs are supplementary wefts. I love it when warp float patterns and supplementary wefts are combined this way and have only seen that once in an old Mexican belt. The tails of the supplementary wefts were left hanging out on the inside of the saddlebag pockets. 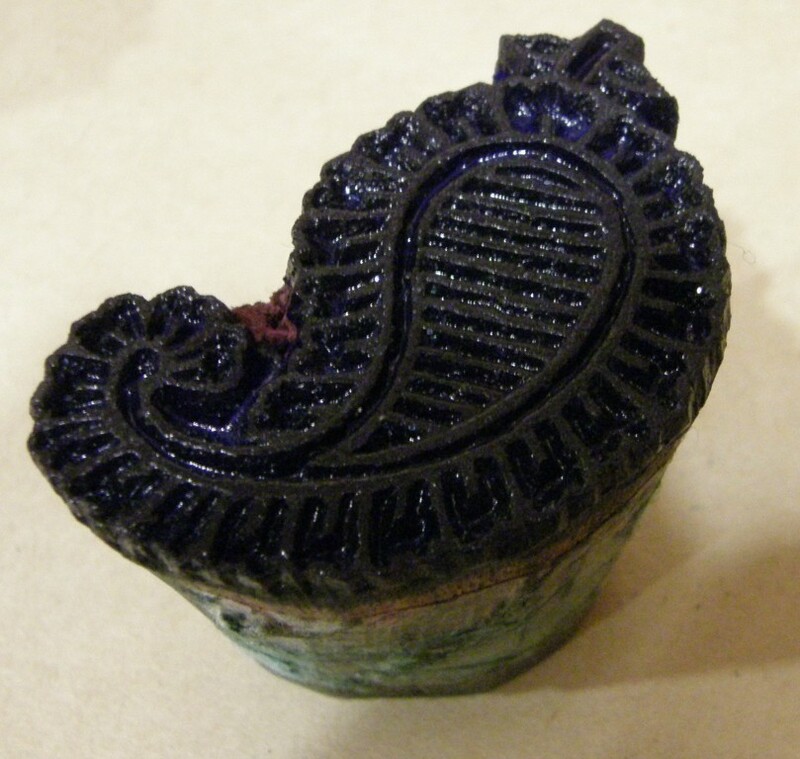 There is a similar piece on this site which is dated at 1930-39. And, this is a four-selvedge piece! If you look very closely a little way above the paper label you will see where the very last weft shot would have been needle woven into place. Thinking about doing a four-selvedge piece with cotton makes my hair stand on end! I tried it once….maybe one day I will try again! I have more to show but will leave it here for this week. Let me end with Jennifer taking up the love of the curious coil rod. She placed one on a band which had started its life on her inkle loom. After transferring it to her backstrap loom she was disappointed to see that it had developed a serious ridging problem…that old corrugated cardboard thing that I have discussed here many times and have finally managed to conquer. This is going to be a beautiful guitar strap! Well, it’s back to cleaning seven weeks of accumulated dust and getting things in order. Hopefully, I will be back at my loom soon. The embroidery may possibly be executed in threaded backstitch (google it and let me know), but it’s hard for me to tell. Exquisite piece, though. Thanks Kristin! I googled it and it does look very similar. Dorothy and I thought it might be something like that too but when I pulled on some of the strands, it didn’t seem to make sense. The other thing is that on the backside you do not see what you would typiaclly see as a result of back stitch. The stitches on the reverse simply pass horizontally quite erratically (they are not all even width) and the spacing between them is uneven too. I looked at the back and I wish now that I had taken picture of it. 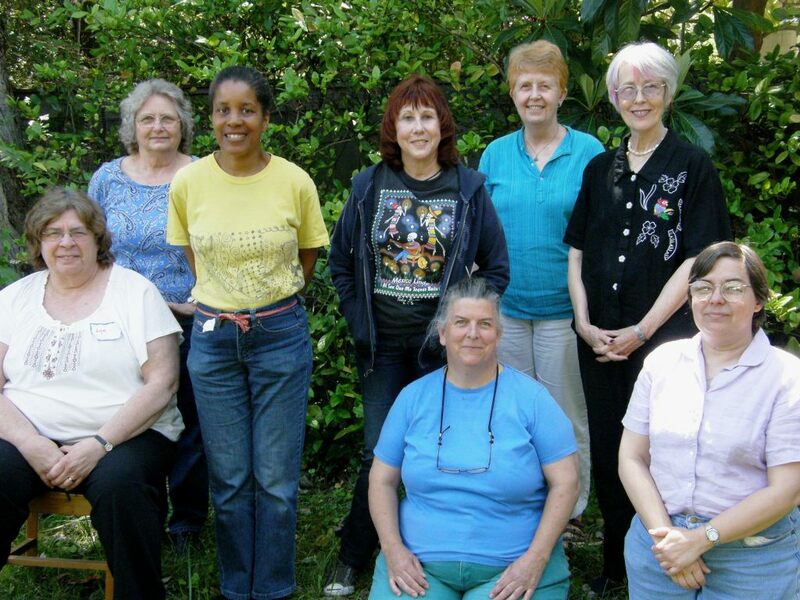 guild members who do student programs. She didn’t bring one for me to photograph, she brought one to give to me! Lucky students and lucky guild members! They were very impressed. I hope you get to meet up with Dorothy again soon, Anne, and see her progress. Perhaps a “raised chain band” not pulled too tight, which can be found by googling Sarah’s Hand Embroidery tutorials, chain stitch family. You know, Jayne, I think you are right! 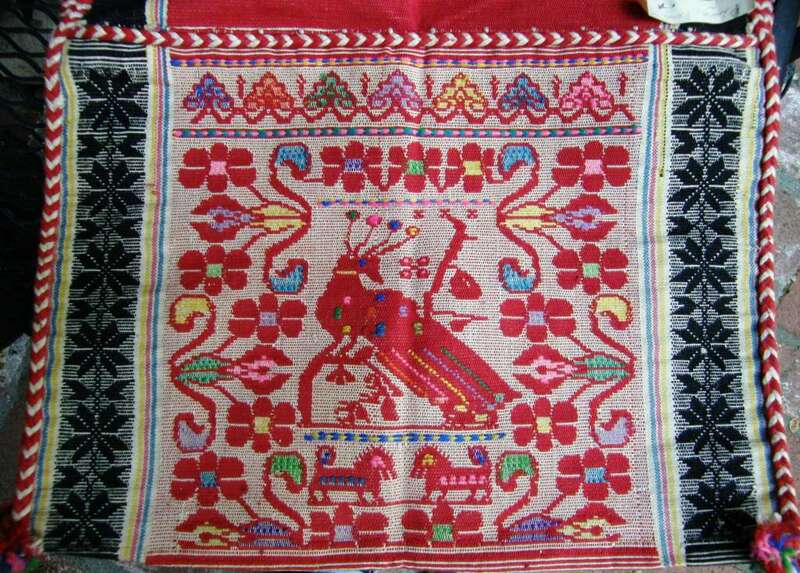 I don’t think that the Peruvian stitcher made her horizontal stitches as wide and she was also using wool thread which fluffed and filled out more. Also, she didn’t use a contrast color for the chain stitch. The finished stitch in that tutorial has the “look” of a vertical backstitch running down the middle which is why Dorothy and I had thought about that. I need to try it in wool now to see how it looks. Thank you!! Gracias por escribir. Es muy bueno saber ahora el origen Ayacuchano de esos bordados porque mi amiga Dorothy los compro por internet y no sabia de que parte de Peru vienen. Me encantaria ver el grafico. Me Lo puedes enviar por email. love the post!!!! glad you are safe and sound at home, and your cat still loves you.. 🙂 i love following the tale if the scaffolding loom, regarding the Palestinian embroidery, i think it is some blessing written, it’s clearly a word or a sentence facing 3 directions, now the task it to find out what does it say?? Hi Yonat. Thanks! 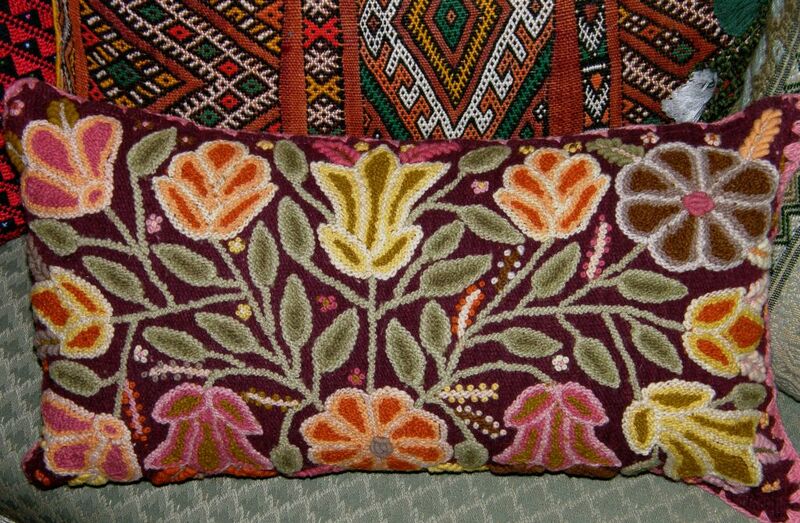 Gloria and Terese, who own that Palestinian embroidery, did tell me that the motif represented a blessing and I am wondering about the way the motif has been depicted. Is is a word or a phrase, how is it pronounced and how is it written. I was thinking that it may have been adapted somehow for the embroidery technique. Un fortunately you can’t Google a motif! Wow! Amazing embroidery. And such sweet little tattie shuttles. No doubt we will soon see something amazing and creative coming from your hands utilizing your new skills! Thanks Julia! So much to do…tatting might have to wait. It does make the perfect project for taking on flights! I need to get some books on it now so I can form the rings and do other fancier things. Hey Laverne! Yet another wonderful post. Thank you. Glad you made it home safe and sound. Loved seeing Dorothy’s set-up. I see a new loom in my future. Hope to see you next month. You might want to look into tambor stitching. It is done with a hook on fabric and looks like chain stitch, except it is faster to create then chain stitch. Tambor was mainly done in The 19th century as far as I know. My image of the original piece is a little fuzzy but that is what I thought of when I saw it. Thanks Carol. It is great to have all these responses and ideas. I know that one of my students does tambor stitching and often shows her work on Facebook. I’ll ask her. In the meantime I am learning a lot about embroidery and loving it. So much information in one post! I ‘met’ tatting when I was young and found it fascinating. She was an elderly British woman in the US and did beautiful work. I’m happy to read it is still an active craft. The center on the Palestinian embroidery says ‘alhamdulillah’, meaning, all thanks & praise are for Allah. My daughter has a book in English that we bought here in Amman years ago that explains the designs in Palestinian embroidery. Like many other kinds of art, the symbols used are a means of communicating where a person is from, their marital status, ect. But, they didn’t use it for religious expression to my knowledge, so this piece may have some special significance. It would be interesting to learn more about this piece. Thank you so much, Alaa. 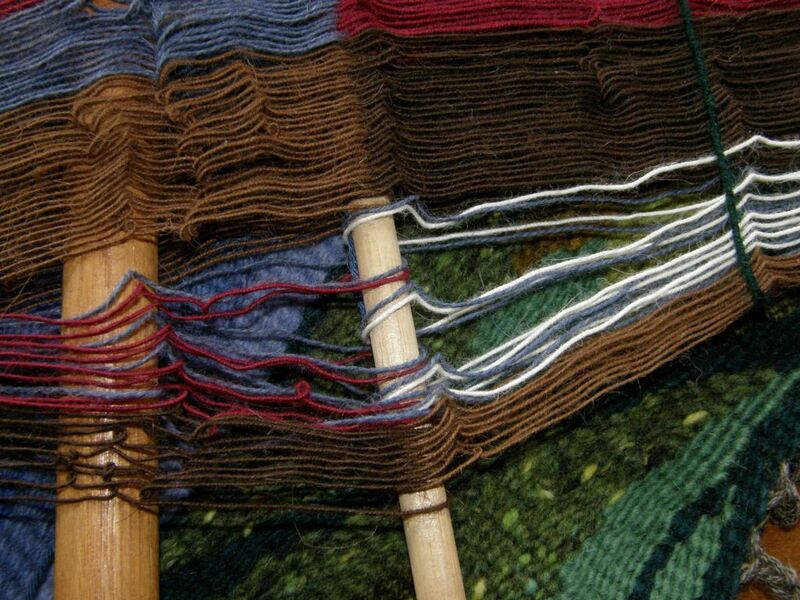 I made the set up for weaving which was shown in this blog. I took it to the first study group meeting and it works really well. Now if I could just read my notes and remember everything I learned. That is great news. Once you are together with all the guys from our group I am sure that it will all come back to you. In any case I am always here to answer questions and we already mentioned Skype….